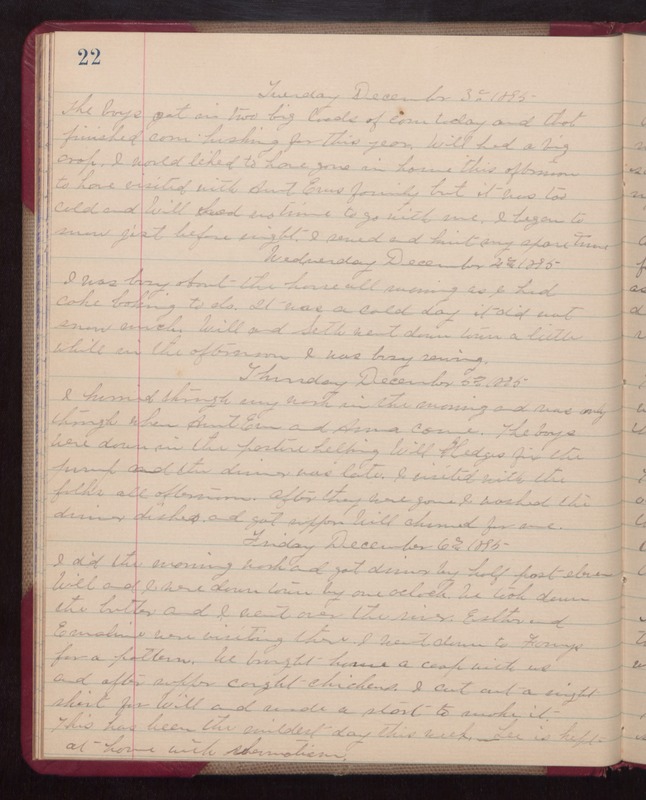 Tuesday December 3rd 1895 The boys got in two big loads of corn today and that finished corn husking for this year. Will had a big crop. I would liked to have gone in home this afternoon to have visited with Aunt Ems family but it was too cold and Will had no time to go with me. & began to snow jist before night. I sewed and knit any spare time. Wednesday December 4th 1895 I was busy about the house all morning as I had cake baking to do. It was a cold day. it did not snow much. Will and Seth went down town a little while in the afternoon. I was busy sewing. Thursday December 5th 1895 I hurried through my work in the morning and was only through when Aunt Ems and Anna came. The boys were down in the pasture helping Will Hedges fix the pump and the dinner was late. I visited with the folks all afternoon. After they were gone I washed the dinner dishes and got supper. Will churned for me. Friday December 6th 1895. I did the morning work and got dinner by half past eleven. Will and I were down town by one oclock. We took down the butter and I went over the river. Esther and Emaline were visiting there. I went down to Fannys for a pattern. We brought home a coop with us and after supper caught chickens. I cut out a single shirt for Will and made a start to make it. This has been the mildest day this week. Lee is kept at home with rheumatism.